The Endoplasmic Reticulum, also known as the ER, is an organelle found in cells. It functions to create and distribute certain substances depending on the location of the endoplasmic reticulum, and perform metabolism. The ER is shaped like a long interwoven network of tubules which are called cisternae. The Rough ER is studded with ribosomes, giving it a rough and bumpy appearance, and the ribosomes are there to create and distribute proteins. The Smooth ER is the tube-like shaped part of the ER, and it produces lipids and aids in metabolism. In 1902, Emelio Veratti discovered the ER, but no one believed him, and it was not proven until 1953 when Keith Porter created electron microscopy and discovered the Endoplasmic Reticulum. The rough Endoplasmic Reticulum is a part of the Endoplasmic Reticulum which composes it along with the smooth Endoplasmic Reticulum. The main reason for the name of this being the rough Endoplasmic Reticulum is that there are ribosomes all along the membrane that pass along Messenger RNA through the membrane into the channel. These ribosomes appear on the surface to give this a very rough and bumpy look, giving it the name Rough Endoplasmic Reticulum. In an average liver cell, there are about 13 million ribosomes on the endoplasmic reticulum. The rough Endoplasmic Reticulum works with the ribosomes in its membrane to take polypeptides and amino acids away from the cytosol and continues protein production. Four polypeptides are combined in the Rough ER also to form hemoglobin. A few of these proteins enter the lumen or space inside the ER and other proteins are processed in the actual membrane. In the lumen, proteins are folded to create the structures needed to be recognized at other linking sites. Often times proteins then go to the Golgi Apparatus where they are finished. They are put in vesicles after being finished and are then delivered to any locations in the body which they are needed at. In short, the Rough ER helps create some proteins, fold some proteins, and mainly controls and sends them. The Smooth Endoplasmic Reticulum is a tube-like organelle that forms a network of tubes throughout the cytoplasm. The inside of the smooth ER is called the lumen, and it is surrounded by a phospholipid membrane. It is quite dispersed, unlike the Rough ER which is bunched up more-so near to the nucleus and Golgi Apparatus. 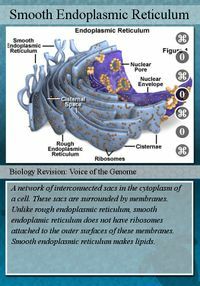 The reason for the Smooth Endoplasmic Reticulum having its name is that it is not studded with ribosomes, giving it a smooth appearance. The first person to ever view the cell was Robert Hooke in 1665. Since that time, scientists have constantly been improving technology and learning new things about the cell. The Endoplasmic Reticulum was actually one of the last organelles to be discovered, although it is so large and plays an important role in the cell. In 1902, Italian scientist Emelio Veratti, a student under Camillo Golgi(Discovered the Golgi Apparatus), finally discovered the Endoplasmic Reticulum. He was researching, using Golgi's staining techniques, and discovered a structure within the cell that was separate from muscle filaments. He could not prove the existence of the ER to anyone, although he spent much time on his drawings and papers trying to show that it exists. In 1953, over 50 years later, Keith Porter created electron microscopy, which gave him the ability to view a reticulum inside of the cytoplasm. Then, in 1954, him and George Palade took high-resolution photographs of the Endoplasmic Reticulum and finally proved its existence. . Without their scientific work and unrelenting attitude, the Endoplasmic Reticulum may not be known about to this very day. This is an informational song about the Rough Endoplasmic Reticulum. ↑ The Endoplasmic Reticulum "NCBI" 28 January, 2015 (Date-of-Access). 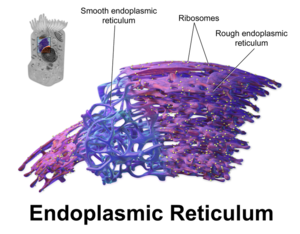 ↑ Endoplasmic Reticulum "Wikipedia" 27 January, 2015 (Date-of-Access). ↑ Smooth ER: Definition, Functions, and Structure "Education-Portal" 27 January, 2015 (Date-of-Access). ↑ From rags to riches — The history of the endoplasmic reticulum "Elsevier" 27 January, 2015 (Date-of-Access). This page was last modified on 10 June 2016, at 12:08.